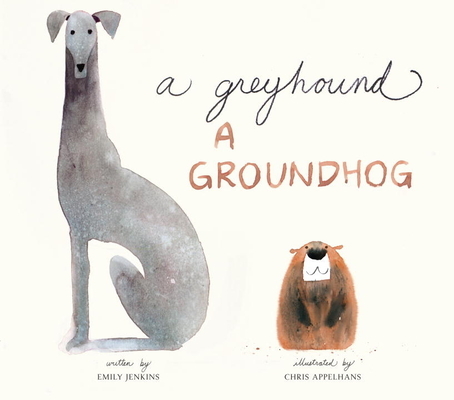 A greyhound and a groundhog become friends in this completely adorable picture book. From a heavyweight author and illustrator duo comes a delicious tongue twister of a picture book that features a little round greyhound and a little round groundhog. With very spare, incredibly lively language, this is an entertaining read-aloud, with two amazing—and oh-so-adorable—characters at its heart. When a greyhound meets a groundhog, wordplay and crazy antics ensue. The two animals, much like kids, work themselves into a frenzy as they whirl around and around one another. (Around, round hound. Around, groundhog!) The pace picks up (Around and around and astound and astound! ), until they ultimately wear themselves out. Emily Jenkins has written many highly acclaimed books for children, including the picture book Toys Meet Snow, a New York Times Notable Book and a Wall Street Journal Best Children’s Book of the Year, and the popular, award-winning chapter books that feature the same beloved characters, Toys Go Out, Toy Dance Party, and Toys Come Home. She is also the author of A Fine Dessert, a New York Times Best Illustrated Book of the Year; Water in the Park, a Booklist Editors’ Choice and a Bulletin Blue Ribbon Book; and Lemonade in Winter, a Publishers Weekly Best Book of the Year. Visit the author at emilyjenkins.com. Chris Appelhans was selected as the Children’s Choice Illustrator of the Year at the Children’s Choice Book Awards for Sparky!, written by Jenny Offill. The book received two starred reviews, including one from Booklist declaring, “Appelhans is a revelation.” Chris has also worked on several films, as an illustrator and a production designer for Coraline, an environment designer for Fantastic Mr. Fox, and a visual development artist for The Princess and the Frog.